Product Consists : Bunch of 12 Red Roses, Celebration Chocolate Pack (Weight : 125 Gms) along with 12 Inch Teddy bear. We have presented here exclusive collection of Valentines Day gifts. This elegant gift hamper is one of the best gifting solution to you. 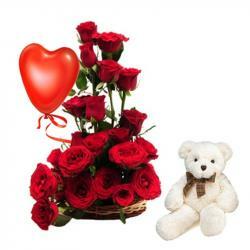 This hamper is comprised with beautiful bunch of red roses and cute teddy bear. Rose is king of the flowers, everyone love this more than the other flowers. This bouquet contains dozen long stem Roses arrange neatly with other green fillers. This hamper also includes the adorable cute teddy bear which conveys that your love one is very much adorable and they feel happy with Celebration Chocolate Pack. Buy this gift item for your better half and express your genuine love for him/her. 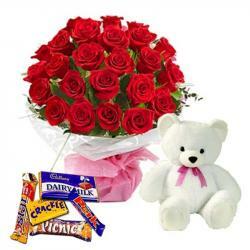 Product Includes: Bunch of 12 Red Roses, Celebration Chocolate Pack (Weight : 125 Gms) along with 12 Inch Teddy bear.